Yes - it is possible to have tasty, moist cake on a gluten-free, dairy-free, refined sugar-free diet. honey according to taste- I usually use a small cup of our home made honey. Separate the eggs, beat the eggwhites till stiff. Mix all other ingredients, at the end fold in the eggwhites gently. Bake at 190 degrees for 45 minutes- Voilà ! Decorate according to taste or occasion. 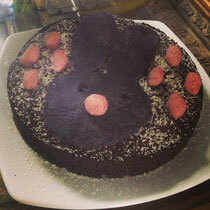 The cake in the picture was for Easter so I made it with purple carrots for extra effect. But you can also use normal orange ones or white ones look good too. For the decoration I made home-made marzipan with ground almonds and honey. It is basically a mixture of ground almonds and honey- keep adding honey to the ground almonds until you reach the desired texture, then cool for about an hour before processing it. For extra colour effect I use flavonoid rich antioxidant fruit powders- the purple was Acai and pink raspberry.